I purchased this beautiful accent table from Goodwill a couple of weeks ago and knew exactly what I wanted to do with it… transform with Annie Sloan Chalk Paint and some of her specialty waxes! 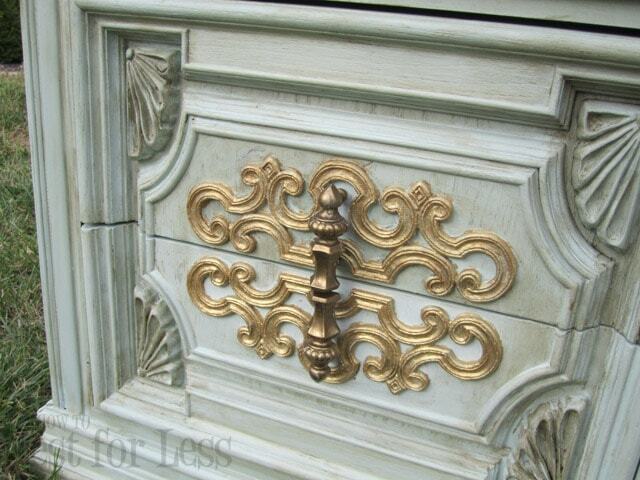 I quickly fell in love with the unique hardware and detailed carvings when I first spied this piece. I scooped her up for only $12! Yeah, I could hardly believe that price for a piece in such great condition. So here’s the before… and after! Here’s how I completed the transformation. 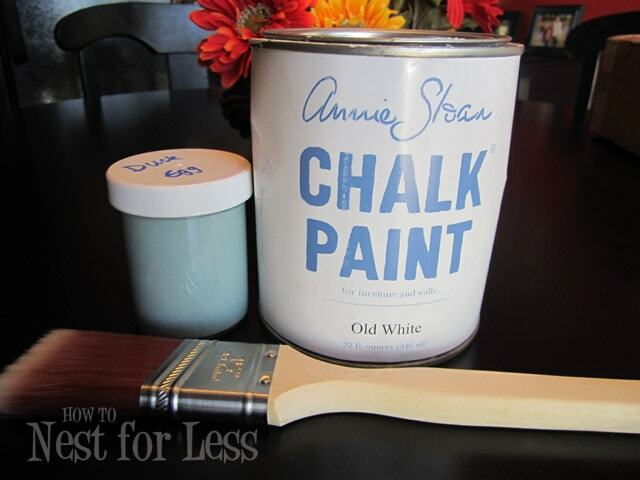 I recently purchased some Annie Sloan Chalk Paint tester pots from Shades of Amber for only $7 and thought this was the perfect project to try Duck Egg Blue. I mixed it with just a hair of Old White and a splash of water. I decided to keep the top in the original wood condition, but it had some deep niches and scratches that I had to sand down with my power sander. 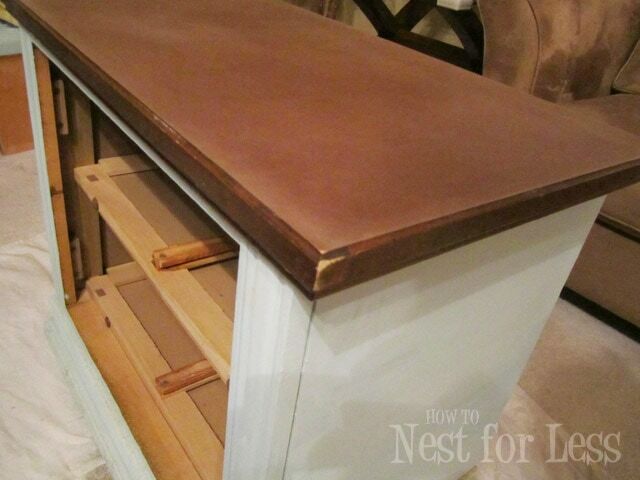 I then used Minwax PolyShades (a mix of stain and polyurethane) in Antique Walnut to refinish the top. Now for my favorite part: the wax. I decided to use a combination of dark and clear wax from Annie Sloan. 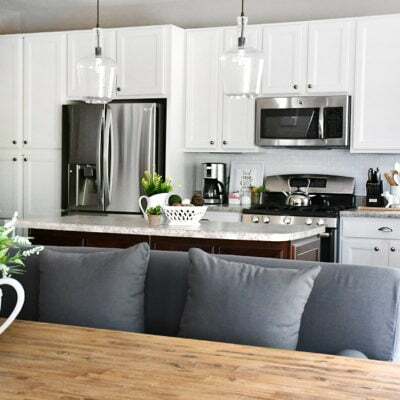 Here’s a tip: always start with the clear wax all over the furniture, then add a bit of dark wax. 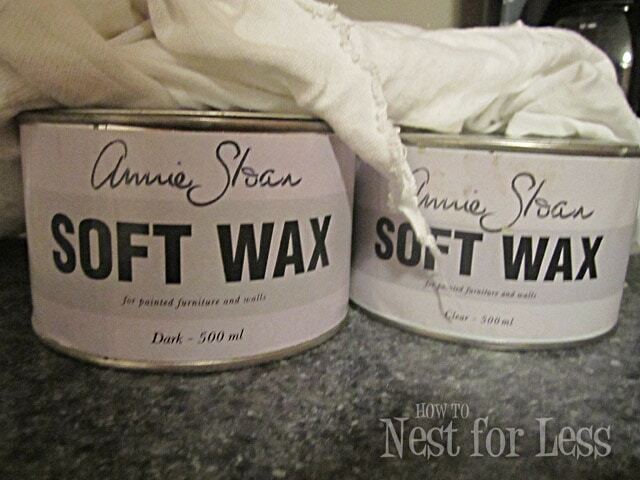 If you add too much dark wax, you can add a bit more of clear wax to tone it back. Definitely play around with it to get the right look and feel! I also decided to really enhance the color and contrast of the hardware so I gave it a quick coat of gold paint. And voila! The transformation is complete! This turned out fantastic…I love it! What a transformation! And what a steal! Beautiful! It turned out so beautiful!! Great job!! I love this piece Erin! Beautiful! Ooooh that hardware is FAB. U. LOUS! Beautiful makeover! 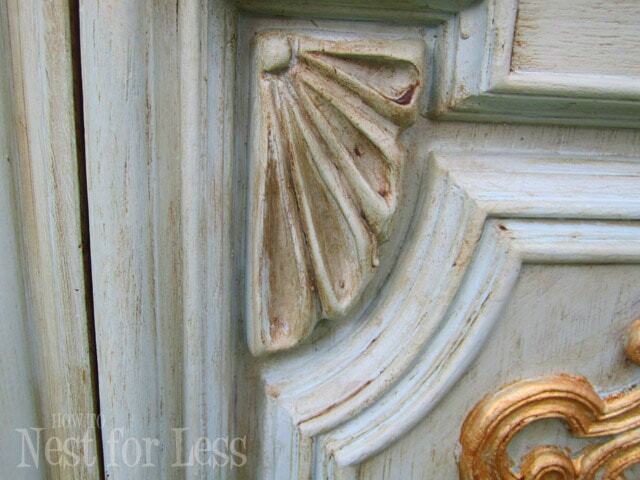 Beautiful…I love Duck Egg Blue! I love the colors you chose! 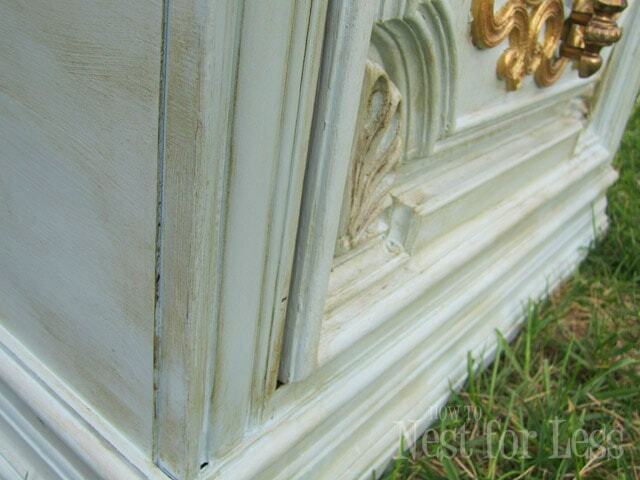 Did you do any sandpaper distressing? 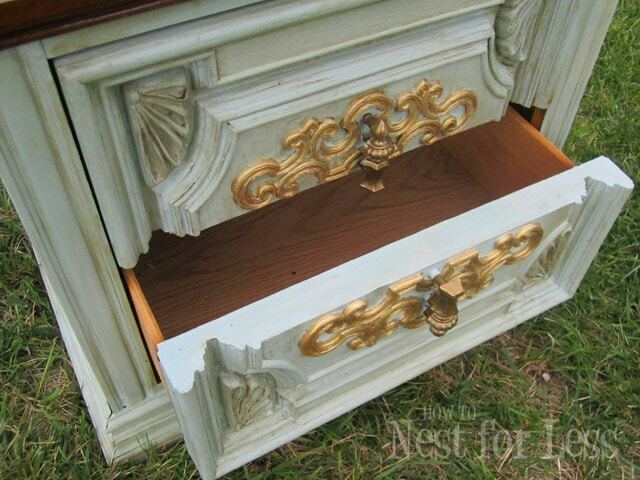 One other thing you might try, not that this table needs it, is to paint the interiors of the drawers. It really adds a lovely element of surprise, like in this project with the duck egg blue on the drawer interiors: Chalk Painted Desk. I also picked that desk up for a great price and made it beautiful again! Keep painting! Cute table. I’m curious– how far do you think the tester pot will last you? I’m about to take the plunge into ASCP, but don’t know which colors I want. Shipping is killer on it, so I don’t want to just get a test pot if it’s not even going to finish a single piece, but also don’t want to be stuck with colors I don’t really care for. What do you think? Kayla: A little tester pot was perfect to finish this end table! 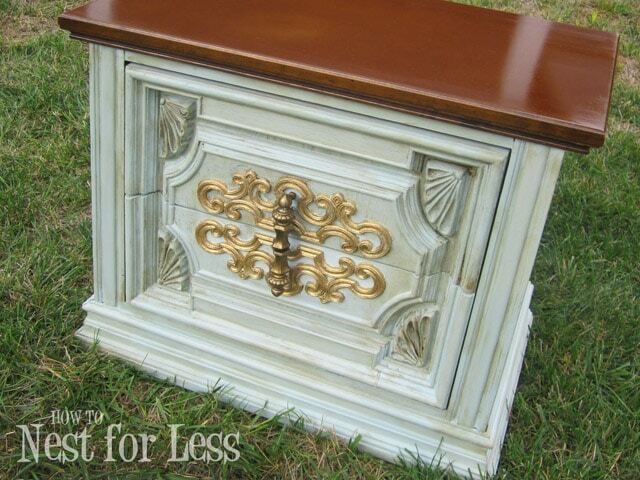 I was the same way; I didn’t want to spend $35 for paint on a little end table. With the tester pots from Shades of Amber, I was able to get 5 different colors for the same price as one normal pint of paint! 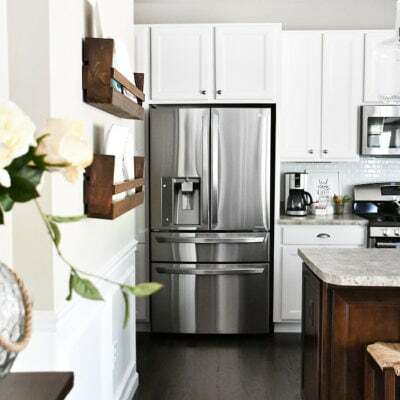 It won’t cover a huge amount of space, but perfect for those little pieces. 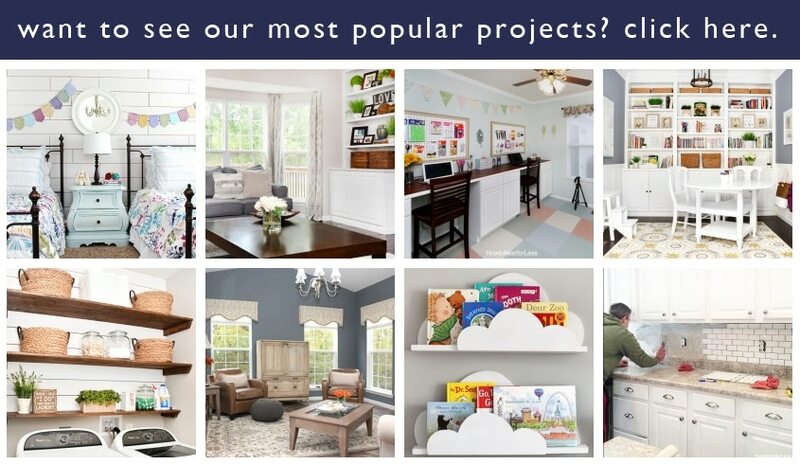 I had a tester pot of Louis Blue that I used on my kitchen stools, a baby doll crib and some lettering for my daughter’s room. Hope that helps! Very sharp! Great color combo too. What a bargain…and you made it look so wonderful! Love the technique you used…especially helpful to me were your tips on waxing. Thank you for sharing! Robin’s egg blue is definitely one of my favorite colors. 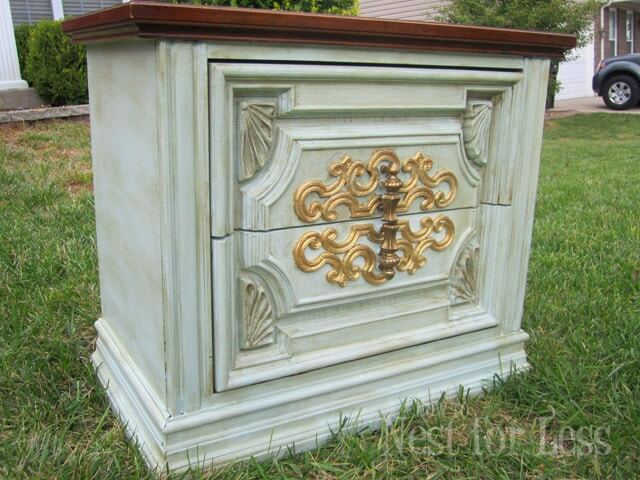 I refinished a dresser in that color and I love it. The top is gleaming! Super job! I love what you did with the accent table! Beautiful job. Lovely! 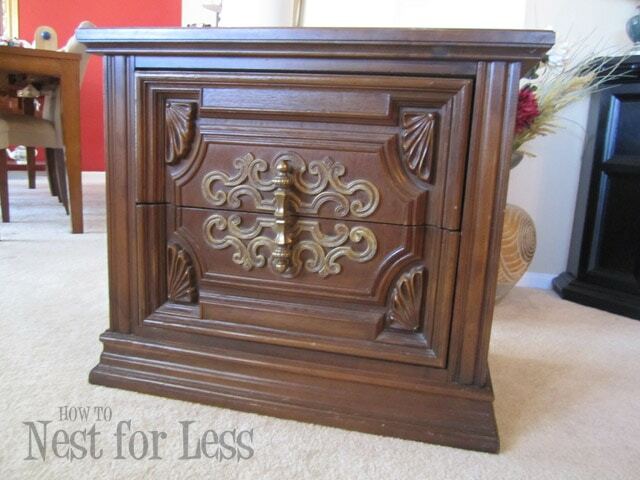 I really like the wood top look and painted bottom! That is an amazing transformation!!! I love it! how fun is that? 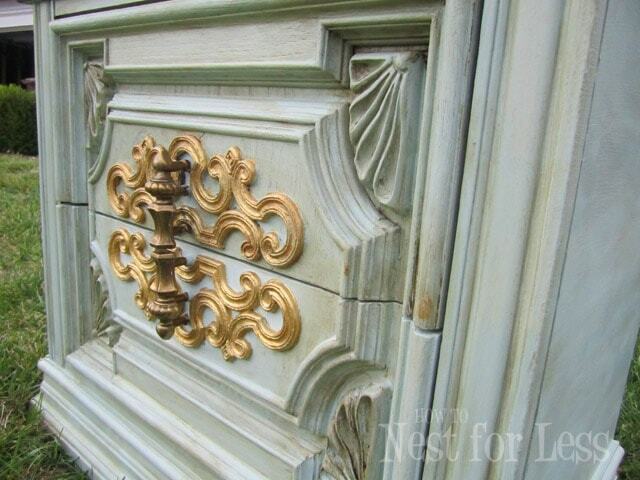 love those gold details! What a great restyle! I have both of those colors maybe I will give this combination a try. 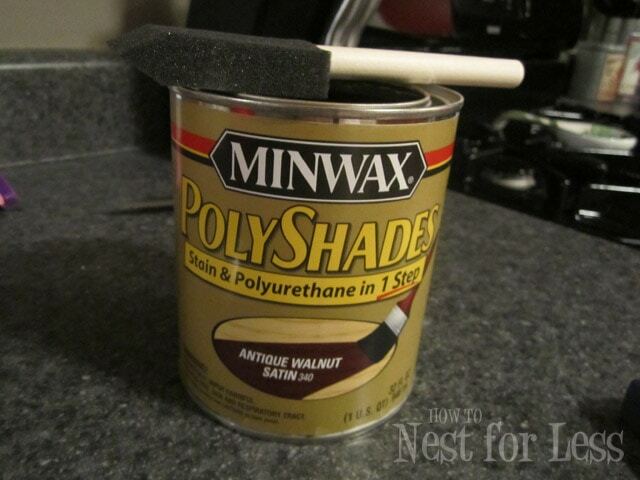 I have never used Polyshades but I really like the look of it……..so I will have to purchase Polyshades. I understand why you’re a little bummed it’s such a great piece. Enjoy the piece while you still have it 🙂 Have you ever tried selling on Craigslist? 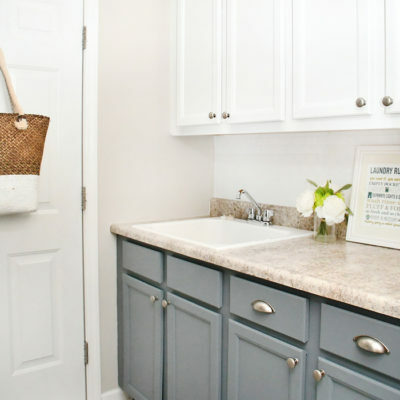 You did a great job….I have been dying to try this paint! I’m your newest follower and would love for you to follow me. cute! this would be a great addition to my blog party. I hope you’ll join!! Look at that gold detail! It looks fantastic! Great job.